The Natchez Trace Parkway is a National Parkway maintained by the National Park Service. It is about 444 miles through three states, limited access, only cars and recreational vehicles are allowed, and the speed limit is 50 mph. It dates back many centuries, from animal trails, Indian paths, and settlers. In the early 1800’s men from the Ohio River Valley floated cash crops, livestock, and other materials down the Mississippi River on wooden flatboats to sell their goods at Natchez or New Orleans. Then they sold their boats for lumber, and walked or rode horseback home on the Old Trace. Famous men such as General Andrew Jackson, Meriwether Lewis, Jefferson Davis and Ulysses S. Grant have also traveled this path. All along the route are historic points of interest, with parking areas and interpretive signs. This is our third trek up this route so we did not stop at every site this time, but I still managed to take a lot of pictures. Last night we stayed at Rocky Springs Campground, one of a few free campgrounds right on the Trace. There was no Internet, cell phone, or TV signal. Tonight we are at Jeff Busby Campground at Mile Marker 193. Only 251 more miles to go! 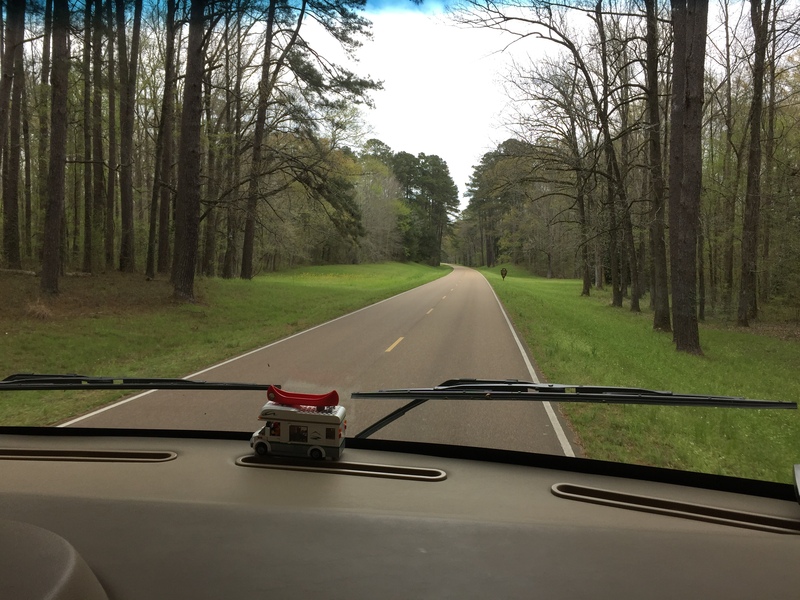 This entry was posted in Daily Post and tagged Natchez Trace Parkway. Bookmark the permalink. On my list of scenic drives to make one day. Enjoyed your post.